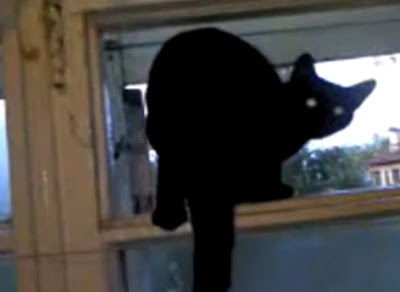 Here's an extraordinary video clip of a barking cat. At first I was inclined to think it was faked, until the cat changed from barking to meowing toward the end. Amazing! "Barking? What are you talking about? I've been meowing the whole time..."
WOW ! I just played that & my dog went nuts. She never responds to cats meowing or dogs barking when it's on TV. I thought there was a dog outside barking..